Over time, even newer motor's leaves a residue over the surface of your pistons and related combustion area surfaces. If that residue and carbon deposits collects instead of burning off, one day, it will come loose. I notice this happening as the motor sits - like overnight. That carbon comes lose and falls to the top of your piston, in a thumb-thick size mass. When your motor is started the next morning, your motor's pistons will slam into the tiny combustion area top - and at each rotation of the piston to the top of the cylinder, you hear a knock as the piston smacks the carbon against the combustion chamber top. This produces a tap-like thump, thump, thump. Sometimes the tap-like thump, thump, thump sound comes and goes. The $1500 to $2500 remedy by a mechanic is performed by removal of the top half of your motor, exposed for cleaning, the tops of the piston, and combustion chamber. Valves, part of the area, are machined to resurface their cleanliness. The engine head is re-assembled - all as the knock remedy. Shown here is Mega Power's combo pak 3 item treatment to remove carbon buildup, and Mega Powers 3 item Engine Protector to restore quiet engine operation again. Mega Power's carbon knock treatment. With Mega Power, its now easy, and way cheaper to end your engine carbon thumb thump thump, yourself, without taking your motor apart, for under $100. Order Mega Power online below - and extend the life of your motor for many years for a like-new, quiet performance. The 6 items work together to remove carbon, free sticky piston rings and valves, an add anti-wear protectors to cover engine parts, which keeps them and the combustion area clean. The shinny feeder tool and hose is what mechanics order, at $125, to install Mega Power into the motor suction side, making it automatic to install Mega Power, and frees up time to work on other cars - if doing lots of cars. However, anyone can install Mega Power easily without it - shown in the directions. Mega Power makes it easy and simple to do a complex engine knock remedy by cleaning that anyone, not just mechanics can perform. Just add and drive. Driving does the fix! Directions: 3 items are carbon removers for the top side combustion cleaning, and a cleaner and 2 conditioners are bottom oil side, blowby reducer, and engine smog reducer system cleaning areas that cause carbon. All easily installed. Phone help is free, if needed. Order one Mega Power Engine Knock Treatment. 3 items shown. $65. And Mega Power Engine Treatment $45. Includes instructions, phone help, FedEx to your door. Guarantee. 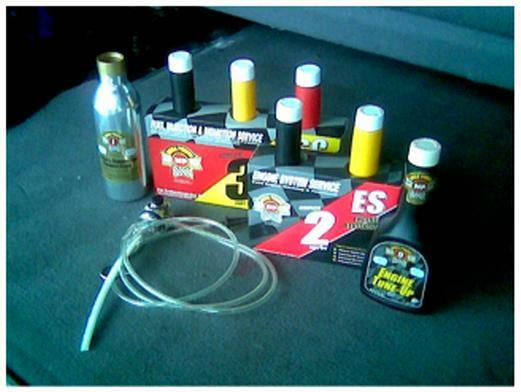 Order 2 Mega Power Engine Knock Treatments and 2 Mega Power Engine Treatments. 12 items. Includes instructions, phone help, Guarantee. FedEx to your door. Just $150 plush $15s&h=$165 total. Save $25$. Order 6 Mega Power Engine Knock Treatments and 6 Mega Power Engine Treatments. 12 items. Includes instructions, phone help, Guarantee. FedEx to your door. Just $390 and free shipping. Save $100. For fleet and resell by mechanics. Mechanics: add install labor of $95 to the $95 product cost. Ordering the Mega Power shinny metal, patented feeder tool and hose. Price $125. Shipped by FedEx to your door in about 3 days with easy to follow instructions. Made for years of rugged usage.